wow, what a cute onesie! ;) want one? get it here! Elliott is crawling. With pace! What can I say? My boy's a mover and a shaker. Fern at this stage was rolling. One way. Elliott is not only crawling but pulling himself up to sitting and - this week - actually pulling himself to standing and holding onto stuff. Like the body of our sleeping Labrador, for instance. Last night I found him draped over the dog, clutching onto his fur. If only I'd had a saddle I think he might well have taken him for a gallop about the living room. My oh my. At least young Elliott crawls properly. Our little guy army crawls everywhere, he's like a snake stalking through the grass hahahaha!!! Oh and I think I might need to get my little boy one of those cute Easter onsies!! Do I have to buy them through Etsy? WOW! He is very much a mover and a shaker isn't he. I can't remember when Will started to crawl but it certainly wasn't that young! He is so cute, doesn't he just have the sunniest smile! 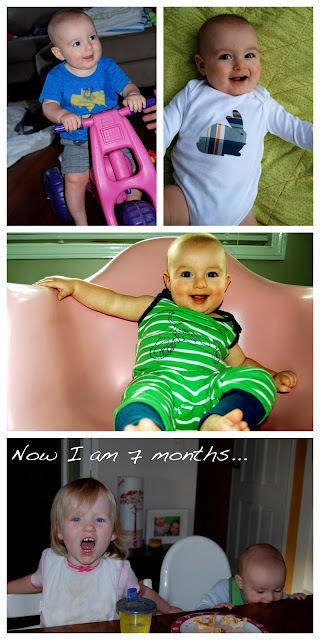 And where has 7mths gone, it seriously feels like yesterday you were going into labor! On a side note, doesn't that bottom pic of Fern look very very much like her aunty Michelle?!!? What a cute little guy Eli is shaping up to be! I have missed reading your blog...just catching up on your posts now as i haven't been online much for weeks. Love the Easter onesies and can soooo relate to the terrible sleeping issues with the toddler. So ironic that izzy is having more problems with sleep than Ayla! Love to new design on the blog by the way!